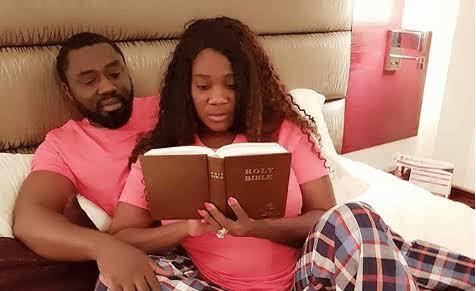 Early this year, reports made the rounds that actress Mercy Johnson was experiencing some turbulence in her marriage after she deleted all her pictures, including the ones that captured her husband, from her Instagram page. Although the actress debunked the rumour a few days later by posting new photos of her and her man, she never really addressed the issue till she spoke to Saturday Beats recently. In the chat, she jokingly stated with a wide smile that she would never return the beautiful wedding ring her husband gave her. “I did not feel bad when I read the news that my marriage was hitting the rocks because it was not true. I am very comfortable in my own space and I am not out to please anybody. I am always true to myself and I continue to be a happy person. There was absolutely no problem between my husband and me, I only deleted the old pictures on my Instagram page. They were old so I deleted them to post new ones. I am not letting my husband go; even when he is angry, I would beg him. You see these beautiful rings that he has given to me, I am never returning them,” she said.